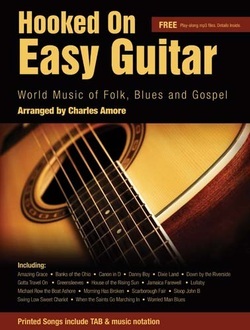 Hooked on Easy Guitar contains 30 favourite but easy to play titles. The melodic line; TAB line, words and easy to read guitar chords combine to create a fun yet user friendly collection which includes titles like: Amazing Grace; Danny Boy; Canon in D; House of the Rising Sun and 26 more appealing titles. This is a must have collection for all guitar players – old or young – beginner or seasoned veteran. Free audio accompaniment tracks are available for download for this book.